Ah, the Internet and the endless slew of social media sites and apps it continues to spawn. We have only recently come to terms with the need to use technology in the classroom. And now we have to add social media to the mix? Sigh. But what this teacher has seen is a golden opportunity, a chance to use something your students are excited about for educational purposes, our main purpose being, helping them improve their English communication skills. But what is Instagram and how can you capitalize on its appeal to engage your ESL students? Launched in October 2010, Instagram is basically a mobile app that allows its users to share photos and 15-second videos with their followers. With Instagram, you can apply a variety of filters to photos and videos, and add captions. A very interesting feature of the video recorder is that you can delete specific portions of the video – there is no need to do it all over again. Finally, users have the option to share their photos or videos on Facebook, Twitter, email and other social media sites. You and your students may adjust your visibility settings so that your photos and videos are not public. You’ll need to follow a user to be able to see their stuff. I recommend reading Instagram’s policy regarding privacy and familiarizing yourself with its settings. Be sure to use hashtags for each specific assignment or project so that they are easily searched and found by everyone in the class, for example, #ESLmyfavethings or #msgarciasclass. Instagram is available in 25 languages, so chances are your students may navigate the app in their own native language. Encourage them to switch their language settings to “English” for an added benefit to using the app. What could be a better way to keep your class connected over a long break than to have them post photos of what they’re up to? Give your class a specific hashtag (#mywinterbreak) and have them post photos with captions in English. Students may choose to comment, interact and stay in touch! Show and Tell is a classic in any classroom. Kids are usually instructed to bring one item to show to the class and to talk about it. Now, thanks to Instagram there is no need to actually bring the item to class – they can just snap a pic to share. In fact, because they can take several pics, you may allow them to share more than one item. Is the topic “favorite things”? Ask them to take photos of their five most treasured possessions. If you live in an English-speaking country, have your class take photos of any signs they encounter. Students share their photos and discuss what the signs mean. For example, “No smoking” means “you are not allowed to smoke”, while a camera with a slash across it, means “you are not allowed to take photos”. If you don’t live in an English-speaking country, challenge students to find signs in English (in some countries stores typically put up “Sale!” signs). Instruct students to snap a pic of someone doing something wrong or the evidence of something that should/should not have been done. For example, a student takes a photo of an empty soda can lying on the sidewalk and captions it, “We shouldn’t litter/throw garbage in the streets”. And while on the subject of captions... There are lots of fun writing activities you can do with your class. Post an interesting photo and have them caption it in the comments; the best caption wins a prize! Or have your students share photos and caption a classmate’s. Share an interesting photo as a prompt for a creative writing task. Students will see the same photo…how many different stories will they come up with? You may not be able to record long conversations or discussions in 15 seconds, but there are plenty of short exchanges you may want to share on video like saying hello/goodbye, formal greetings, how to congratulate someone/ask for directions/start a conversation. Students will have access to these short dialogues on their Instagram accounts for quick access any day, any time. Is there a word or phrase a student has a hard time pronouncing? Record yourself saying it and share it with this particular student for extra pronunciation practice. Instagram was launched just four years ago and skyrocketed to popularity, reaching 100 million users in less than two years. Ninety percent of its current 150 million users are reportedly under 35. The potential is there. It’s up to you to capitalize on it. No, I wouldn’t force a group of students to use it if they have no interest in this app. Don’t use Instagram for the sake of using technology in the classroom. But if you happen to have a group of youngsters who are very much into social media, Instagram may be another great way to engage them. * This question was sent in from a real ESL teacher, just like you! If you need any advice on a particular topic, share your question in the comments below. Or tweet your question to @busyteacher_org with the hashtag #ESLTeachersAsk. Your question might get picked and featured in an article! Decades of research have shown that having a strong vocabulary is one of the single most reliable predictors of a student’s future academic and career success. 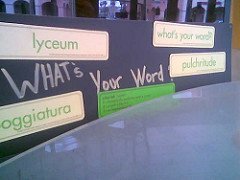 One of the best ways to help students learn new vocabulary is to use vocabulary words in your everyday speech. Make sure to slip in vocabulary words as you talk to your class (“There’s quite a dearth/plethora of enthusiasm this morning!”), as you give feedback (“Great job on being diligent in your fact-checking.”), or as you interact with your students (“I appreciate your tenacity, Mr. Jones, but there will be no retakes.“). Use strong vocabulary in all your interactions and your students will learn by example. Pick one of the many “Vocabulary Word of the Day” Twitter options for your students to follow as part of their homework. Ask students to reuse the “Word of the Day” in a tweet. Have them use a custom hashtag (#MsJonesEnglish11) to make it easy for you to see who has participated. Or, better yet, rotate monitoring duties among your students, so that one student is responsible for reviewing all the tweets and nominating the best ones to share in class. Students are never too old for a word wall, especially when they can participate via their smartphone. There are so many great images and memes that pair vocabulary words with related cartoons and images. Task your students with helping you to create a visual word wall via Instagram or Pinterest (see our example here) as part of their homework. Create further engagement by having students use the vocabulary words in the comments. A daily vocabulary warm-up is a great way to get the class started. Take the first few minutes of class, as students are still settling in, to review a word of the day. This can be a word that you select, or better yet, you can assign students to select a word and be responsible for defining it and offering examples to their classmates. The best way to learn vocabulary is to read more. 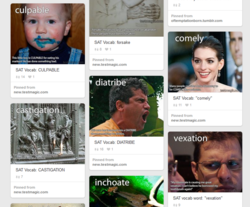 Assign vocabulary-rich online articles for your students to read as part of their homework. There are great articles from top-notch sources like The New York TImes, CNN, and National Geographic that are about teen-friendly topics AND that use lots of great vocabulary words. If you’re based in the Philadelphia area, you can check out our daily suggestions at Philly.com/vocabulary. Do you have other suggestions or tips? Let me know @professorword!